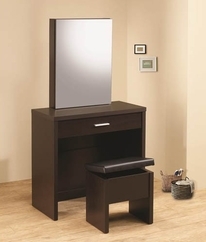 Our collection of vanity sets offer a variety of stylish vanities to complement your taste. Constructed of both metal and wood, with many different styles and finishes available, you are sure to find the perfect vanity to meet your needs. Convenient storage options, attached mirrors, and matching stools are some of the great functional features of these gorgeous vanities. Choose the perfect piece for your home, to create a relaxing and warm spot to prepare for your day. All Vanities ship FREE to the continental U.S., usually in 3-4 business days!